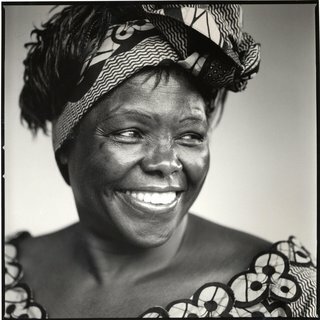 Wangari Muta Maathai was born in Nyeri, Kenya in 1940. In 1960, she won a Kennedy scholarship to study in America and earned a master’s degree in biology from the University of Pittsburgh and became the first woman in East Africa to earn a Ph.D. Under the auspices of the National Council of Women of Kenya, of which she was chairwoman from 1981 to 1987, she introduced the idea of planting trees through citizen foresters in 1976, and called this new organization the Green Belt Movement (GBM). She continued to develop GBM into broad-based, grassroots organization whose focus was women’s groups planting of trees in order to conserve the environment and improve their quality of life. Through the Green Belt Movement, Wangari Maathai has assisted women in planting more than 20 million trees on their farms and on schools and church compounds in Kenya and all over East Africa. This virtuous circle of empowerment through conservation is serving as a model throughout the world, where women both individually and collectively are entrusted with money and material to invest it in ways that make a difference to their daily lives. Wangari Maathai’s Green Belt Movement is a great example of how one person can turn around the lives of thousands, if not millions of others, by empowering others to change their situation. Wangari’s road to success was by no means easy. During the 1970s and 1980s, she came under increasing scrutiny from the government of Daniel arap Moi. She was frequently the target of vilification from the government, as well as subject to outright attacks and imprisonment. She refused to compromise her belief that the people were best trusted to look after their natural resources, as opposed to the corrupt cronies of the government, who were given whole swathes of public land, which they then despoiled. In January 2003, Wangari Maathai was elected by an overwhelming margin to Parliament, where she is the Assistant Secretary for Environnment, Wildlife, and Natural Resources in the democratically elected Kibaki government. Even though she is now being protected by the very same soldiers who once arrested her, her voice on behalf of the environment is still strong and determined. Wangari Maathai is the founder of the Green Belt Movement and the first woman to earn a doctorate in biology in East Africa. A recipient of numerous awards for her work on environmental and social issues, she was elected to Parliament by an overwhelming majority in 2003 and is currently the Assistant Secretary for Environment, Wildlife, and Natural Resources in the new democratically elected Kenyan government. In 2004, she was honored with the Nobel Peace Prize. She lived in Nairobi, Kenya until her passing on Sep 25, 2011.